Podolsk (Roushie: Подольск) is an industrial ceety o Moscow Oblast, Roushie, locatit on the Pakhra River (a tributary o the Moskva River). Population: 187,961 (2010 Census); 180,963 (2002 Census); 209,178 (1989 Census); 183,000 (1974); 129,000 (1959); 72,000 (1939). The ceety o Podolsk grew oot o the veelage Podol, which in the 18t century belanged tae the Danilov Monastery in Moscow. Podolsk wis grantit the status o ceety bi Catherine II in 1791. At that time, Roushie wis establishin the major kintra destricts, appointin govrenors an establishin new ceeties. Afore the Roushie Revolution, Podolsk wis amang ane o the maist industrialisit ceeties in Roushie. A Singer factory producin sewin machines wis established here. The Ulyanov faimily uised tae live in Podolsk. Vladimir Lenin visitit the ceety a nummer o times an even haed a sma estate an cottage thare. In 1900, he held a meetin in Podolsk wi the social democrats frae Moscow an ither ceeties tae win thair support for the Iskra newspaper, which haed awready been in the makin. In 1971, Podolsk wis awardit the Order o the Red Banner o Labor. In the Soviet times, Podolsk wis ane o the industrial giants in Moscow Oblast. At that time thare wur mair nor seiventy factories operatin in the ceety. Maist o the ceetizens wur wirkin at these plants. In 2000 a major militar base wis formit .07 miles frae toun (Microyone) 1 its is currently commandit unner Igor Minin. Podolsk is the steid o the Central Archive o the Roushie Meenistry o Defence. Athin the framewirk o administrative diveesions, Podolsk serves as the admeenistrative centre o Podolsky Destrict, even tho it is no a pairt o it. As an admeenistrative diveesion, it is incorporatit separately as Podolsk Ceety Unner Oblast Jurisdiction—an admeenistrative unit wi the status equal tae that o the destricts. 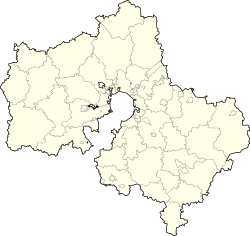 As a municipal diveesion, Podolsk Ceety Unner Oblast Jurisdiction is incorporatit as Podolsk Urban Okrug. ↑ "РАДУШНЫЙ ХОЗЯИН — ГОРОД ПОДОЛЬСК" (PDF). Twin cities international association. Archived frae the oreeginal (PDF) on 2012-03-17. Retrieved 2011-01-15. ↑ The Georgian govrenment an the majority o the UN members consider Abkhazie a pairt o Georgie's territory. ↑ "Podolsk sister cities". Admpodolsk.ru. Retrieved 2010-04-29. Wikimedia Commons haes media relatit tae Podolsk. This page wis last eeditit on 8 Mairch 2018, at 05:12.